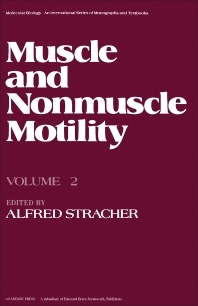 Muscle and Nonmuscle Motility, Volume 2 is concerned with the study of the contraction and the mechanism of movement of muscle cells in a variety of biological systems. The volume provides a view of some nonmuscle motility subjects. The chapters contained in the book deal with the cytoskeletal structure of cells, including the red blood cell; the role of clathrin in cell function; mechanochemical properties of ciliary movement; and the regulation of cell surface structure and function. Platelet motility, microtubular assembly, actin in nonmuscle cells, intermediate filament assembly and function, and cytoskeletal proteins are tackled as well. Cell biologists and biochemists will find the book a valuable source of information.